Every year there are always films of every genre and stripe which fly under the radar of most film-goers. Every film fan knows of several such films and always like to believe they were one of the few who actually saw it in the theaters when it came and went. 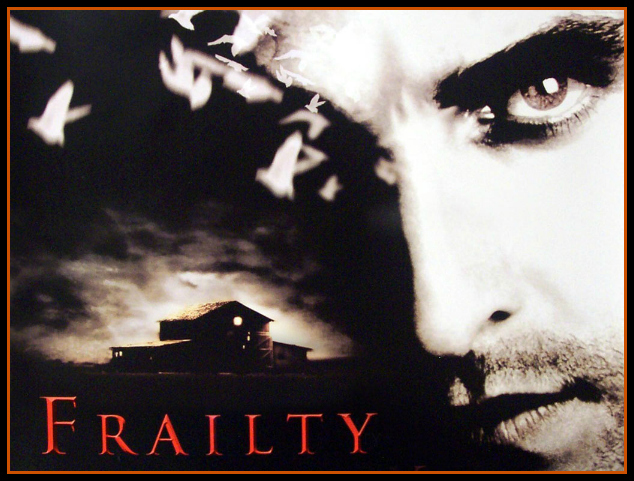 In 2002, one such film was the psychological thriller/horror film Frailty by veteran actor Bill Paxton. This was to be his directorial debut on a feature-length film and for a first time it was a home run right from the start. Frailty was done mostly through flashbacks as told to an FBI special agent by a man (Matthew McConaughey) and how this man knows the true identity of a particular serial killer around the Texas region who has dubbed himself the “God’s Hand”. It’s through this man’s retelling of the origins of the “God’s Hand” that we see the lives of a father raising two young boys as best he can until a sudden “vision” of divine nature changes their lives forever. The father begins to believe that he has been given a divine purpose to find and destroy demons who have taken on human form. To do this deed he has an axe he’s dubbed “Otis” to assist him. The reaction of the two young boys differ as their father goes about his new work. The older brother in Fenton Meiks believes what his father is doing to be illegal and makes him a murderer. On the other hand, the younger brother in Adam Meiks has taken on seeing their father as the hero that he sees him and supporting him in his new endeavor. The film doesn’t inundate the viewer with much gore and violence. This is not say that the film lacked for killings. The father finds and “destroys” the demons given to him on what he calls “God’s list”, but the film doesn’t linger on these scenes of violence. It instead focuses on the reactions of the father’s two sons and the growing rift which gradually begins to grow between the three. It would be this rift which plants the seed of who would ultimately become the “God’s Hand” killer. The film also manages to turn the theme of a father’s love for his sons and vice versa become a taut and disturbing study on the concept of faith. The film also does a great way of twisting the story in a way that we never know who the “God’s Hand” killer was until very close to the end despite everything being told by the man to the FBI pointing to specific individual. This was one of the few films which used the twist to the narrative properly and not as a crutch to make the film better than the source. It’s this source, the screenplay in other words, which makes Frailty such an under-appreciated and great film. There’s rarely any instances where the story takes on leaps of logic that would break the audience from the world they’ve become invested in. In fact, I would say that the film was quite traditional in how it handled the story and characters. There’s wasn’t any special character and narrative quirks to make them stand out from the rest of the other roles. It’s from the performances by all involved, especially the very convincing ones from the two young actors playing the young Fenton (Matt O’Leary) and young Adam (Jeremy Sumpter), that sells the film. Matthew McConaughey as the man telling the story of the Meiks does a great job in a role that others might have gone overboard with. His restrained performance in concert with the young actors in the film would be another reason why Frailty became such a great film. Performances, as great as they were in this film, required for a filmmaker to have a deft handle on his cast and the screenplay. This film was lucky enough to have a first-time filmmaker in Bill Paxton who played to the strength of the screenplay and trust in his actors. He didn’t try to be too cute or direct like someone with something to prove. I know that saying one directed a film with efficiency would be seen as a negative. In this instance I’d say that Paxton’s efficient direction helped the film stay focused on the story and the characters instead of trying to be flashy. Frailty was, and still is, a film that seems to fly under most people’s radars, but it’s also a film that has gained quite a loyal following since it’s initial 2002 release. It’s a rare film that has continued to live up to it’s growing cult status not because of what people might have heard of it, but because it’s a rare film that stand on it’s quality. A film which, from top to bottom, made for a smart thriller with some horror aspects through in that didn’t try to fool it’s audience (even the twist in the story was a true genuine surprise instead of a story cop-out). If there ever was a film that needed to be seen by more people it’s definitely Frailty. This entry was posted in Film, Film Review and tagged Alan Davidson, Betty Gurule, Bill Paxton, Brent Hanley, Cynthia Ettinger, David Kirschner Productions, Derk Cheetwood, Edmond Scott Ratliff, Frailty, Gwen McGee, Horror, Jeremy Sumpter, Levi Kreis, Lionsgate, Luke Askew, Matt O'Leary, Matthew McConaughey, Powers Booth, Thriller, Vincent Chase. Bookmark the permalink. Another good example of what can result when intelligent people make a horror film (perhaps mystery/horror, in this case). Engrossing, surprisingly but still effectively inexplicit, with a unique narrative style and, as you observed, a genuine twist.